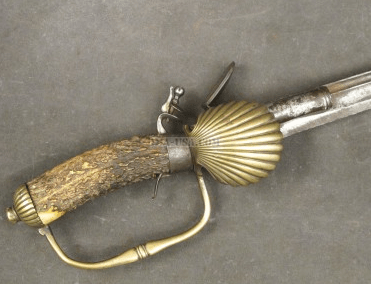 A FINE FRENCH & INDIAN/REVOLUTIONARY WAR PERIOD AMERICAN? SMALLSWORD, ca. 1760: In overall fine condition with smooth steel surfaces. Hollow ground, 28 1/4″ diamond-form, sharp blade with untouched, lightly toned steel-gray surfaces. Fine (European/English?) blade with 65% polish and some scattered light discoloration. 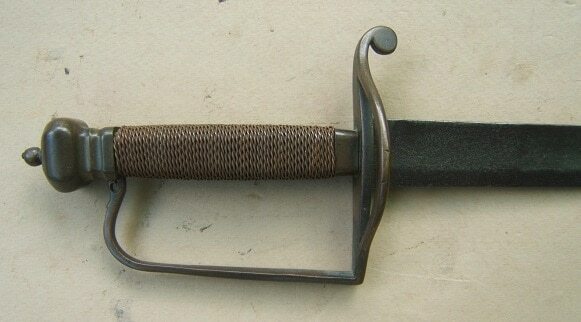 Simply forged steel/iron hilt of classic smallsword form, with a ball-shaped pommel and a stirrup-type knuckle-bow. Double shell-type counter-guard with matching steel surfaces. American?, polished hardwood (walnut?) 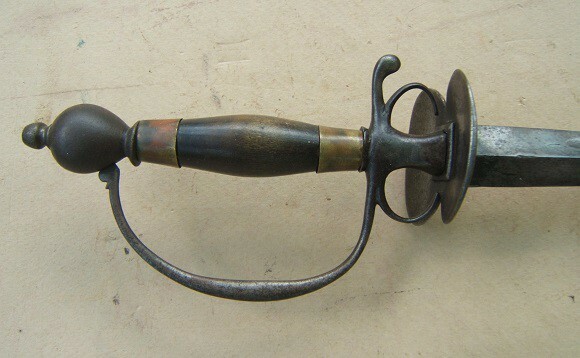 grip with simple brass ferrules and some minor handling marks/signs of use. In overall fine, tight condition. The blade with smooth surfaces and some patches of discoloration: very sharp point and cutting-edges with a fine quality hollow-ground fuller. The hilt with smooth, silver-gray, steel surfaces, en suite. A fine, Officer’s type American? Smallsword, ca. 1760. Overall length, 35 1/2″. For similar examples please see, G. Neumann: “Battle Weapons…”.